In other words, their official blog clearly indicated that Loro Parque did not approve. The FMF had requested a meeting with SeaWorld and HSUS and although initially we received an email from HSUS that indicated we would get a more detailed response, that has not been forthcoming and there has been no response from SeaWorld. Our worry over Morgan and the other orca at Loro Parque prompted two FMF board members (Visser & Lisker) to visit Loro Parque. During 20, 21 & 22 April 2016 they observed the orca in the circus-like shows, as well as in the ‘back’ tanks (including the medical tanks). 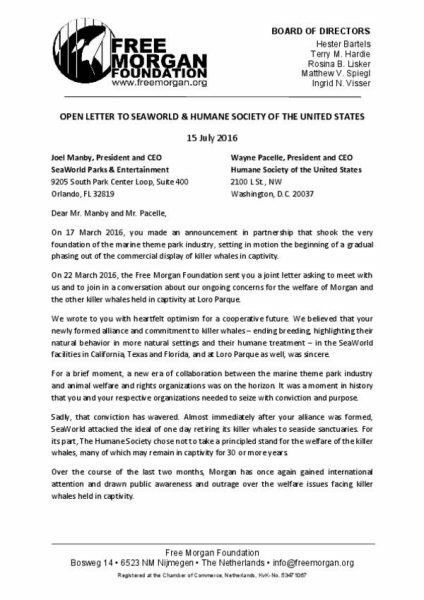 What they found was deeply disturbing and resulted a 67 page report, sent on 15 July 2016 to SeaWorld and HSUS along with the Open Letter (above). The state of the teeth of each orca is of grave concern. When comparing a ‘Health Assessment’ by a veterinarian, to the photographs taken by FMF, less than seven months later, the authors have revealed major discrepancies. Alarmingly, between 41.66% and 75% of the mandibular (lower jaw) teeth were moderately or severely damaged. Such permanent self-mutilation and injuries from drilling the teeth are a reflection of extremely compromised welfare standards for orca held at Loro Parque. Photographs taken of the teeth of each of the orca covers the first section of the report. Scrutiny of those photos identifies that the youngest SeaWorld orca held at Loro Parque (Adán) has had at least eight teeth drilled in the short seven month period. Adán was only 5 years, 6 months old, when FMF photographed him in April 2016, yet his teeth are already severely damaged due to self-mutilation and subsequent drilling by the Loro Parque staff. 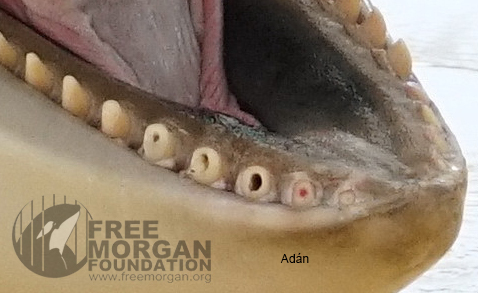 Close up photographs of Adán’s offending right teeth, caused by self-mutilation and staff drilling the teeth and not filling the holes. R2 (second from the front) is red because of either blood or exposed pulp. Adán is only 5 years, 6 months old in this photo (April 2016). The other five orca have had at least 14 teeth drilled and at least 16 teeth have broken. Morgan, who was found to have a fractured (split in half) tooth was observed chewing on the concrete. 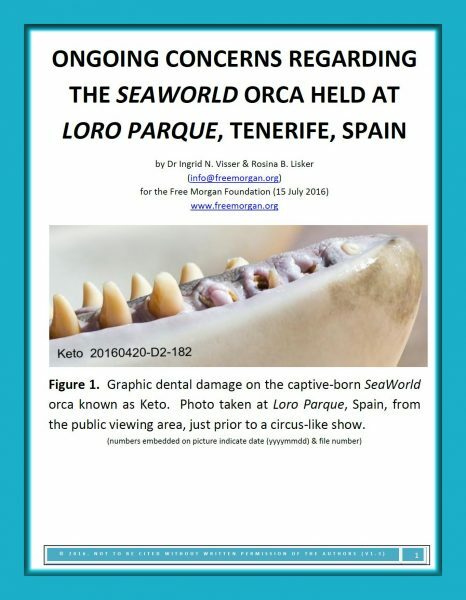 Again, there are grave concerns as Loro Parque have claimed on their official blog that there is nothing wrong with Morgan’s teeth. Morgan’s tooth, fractured in half, but others are chipped and worn to the gum. This has all occurred since she arrived at Loro Parque. Sadly, Visser & Lisker also found that the staff continue to confine the orca in a tank so small it prevents natural body postures and normal behaviour. Such confinement, which is not associated with medical or husbandry needs (such as daily care due to irrigating the teeth because of the drilling), disregards commonsense and welfare guidelines and is against industry ‘best practice’ standards. Three orca, Morgan, Tekoa and Adán are locked in the medical tank during a show. In fact, Loro Parque was documented as violating at least four of the ‘Five Freedoms’ and at least 23 bottlenose dolphin-specific welfare ‘measurements’ (which fall under 11 different ‘Criteria’). We explain a bit more about this on the 5 Freedoms & Welfare page. Legitimate concerns about the welfare of the orca at Loro Parque have been well documented, but have remained unheeded over a period of years, leaving the orca exposed to ongoing risk. It is imperative for these animals to be provided with better living conditions that address these welfare issues. Ensuring that welfare standards are met and maintained requires a transparent, independent assessment conducted by experienced authorities who are external to any political influence. There are many (including the FMF) who are calling for an end to keeping this species in captivity. The industry is hearing more and more from the public about their concerns for the welfare of these sentient beings. We encourage you to speak up and speak out. Contact SeaWorld, the Humane Society US and Loro Parque and tell them that you do not believe that they are caring properly for these animals. These companies keep orca in concrete tanks purely for commercial purposes and display them solely for entertainment. Despite what they will try to tell you, this is NOT conservation and this is NOT education. Keeping orca in captivity has to stop and SeaWorld, who holds 29 orca in its’ name is responsible for more than half of the orca held in captivity around the world. They should be calling on all other facilities to stop breeding orca too. They should be calling for wild captures to stop. The evidence presented in the Visser & Lisker (2016) report is yet another argument to illustrate why orca, as a species and as individuals, are unsuitable for maintaining as zoo animals, show animals or any other form of captivity. We call upon SeaWorld and Loro Parque to recognize the prevalence of the compromised welfare indicators identified by FMF. We ask for them to acknowledge that at Loro Parque the animals’ welfare is severely undermined and that immediate attention must be given to address the situation. We strongly suggest that they place the six orca held at Loro Parque into a seaside sanctuary, where they can continue to receive the medical care they will require with these injuries, but in which they can experience the natural ocean, large enclosures, reduced stress and by default, their welfare will be enhanced. The FMF has offered its help for such a project as we believe in working towards improving conditions for the orca. In particular, removing these orca from the concrete tanks they are locked in will help to prevent even further damage to their teeth. To do otherwise would only be disingenuous and hypocritical of SeaWorld’s and Loro Parque’s claims to be doing the best for these animals and to be companies that give priority to animal welfare.